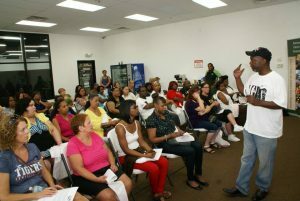 Legally Armed In Detroit, a gun rights advocacy group, has announced that it will provide a free firearm shooting lesson at a southeast Michigan target range for 800 women interested in learning more about firearms and personal protection. There will be no charge for the Firearm Instructor’s safety briefing, the usage of a firearm, ammunition, and range time. Participation is 100 percent free for all attendees. No prior firearms training or experience is required of the women who desire to take advantage of the lesson. Further, experienced women merely desiring to improve their marksmanship skills are also welcome to attend. The free shooting lesson offer was the brainchild of Rick Ector, an NRA Approved Firearms Trainer, after seeing a local television newscast of a young woman’s body being discovered on an east-side Detroit street seven years ago. This year’s event will be the seventh consecutive year it has been conducted. In the first year only 50 women were trained. However, last year the event grew sufficiently to teach almost 600 how to safely operate a pistol. This year’s goal is 800 trained women over the day-long event. It is only with the cooperation of Ector’s fellow Firearm Instructor colleagues and supporters across social media that this event could even be attempted and safely conducted. The ladies FREE shooting event will be held on Sunday, May 20, 2018 at the Top Gun Shooting Sports Gun Range at 22050 Pennsylvania in Taylor, Michigan. FREE Advance Pre-registration is required for participation. Interested ladies should visit the Facebook event page for more info. 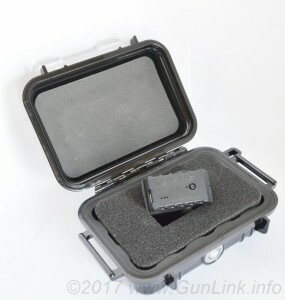 Recently, Casey from MantisX reached out to GunLink to tell us about their system, which they describe as “a firearms training system that mounts on the rail of your gun and gives you real time feedback via an app on your smart phone,” going so far as calling it “most innovative development in personal firearms training in years.” Bold claims, to be sure, but Casey was confident enough in the system to send one over for us to try out. First of all – what exactly is a MantisX? You are probably familiar with the ubiquitous Pistol Correction Targets. Our Pistol Correction Target posts have seen hundreds of thousands of pageviews the GunLink Forums and the GunLink Blog, and have been shared far and wide on other sites, gun stores, and ranges. When Casey first contacted us, the MantisX system was essentially a feature-packed, electronic, “smart” 21st century version of the targets that have been around decades (it has since gotten even better). It works by attaching the MantisX device – packed with sensors, gyros, and other electronic wizardry – to your pistol and connecting it wirelessly via bluetooth to your Android or iOS smart device using their free app. Firearms can be a range of things, from useful tools to fun range toys. However, given their nature, firearms can be dangerous in the hands of a bad guy or someone who does not know proper safety procedures. Project ChildSafe, a 501(c)(3) charitable organization developed by the National Shooting Sports Foundation (NSSF), bills itself as the largest, most comprehensive firearm safety education program in the U.S. The organization has partnered with over 15,000 law enforcement agencies to create safety education messages and had distributed more than 37 million firearm Safety Kits to gun owners in all 50 states and five U.S. territories. You probably already know the Four Laws of Gun Safety. Summer is a great time to get out and hit the range for some shooting fun. While out shooting (or even just handling firearms in general), be sure to practice these four important rules and teach any youngsters or new shooters that you are are shooting with about safe firearm handling. Project ChildSafe has put up a S.A.F.E Summer Quiz about gun safety. Take the quiz today, either by yourself or with your kids to help reinforce safe firearm handling practices. Female participation in the shooting sports is on the rise and that is a good thing! Having a bigger tent with more people involved and enjoying firearms can open eyes (and minds) to the reality of how safe, practical, and fun firearm ownership can be. According to both the National Shooting Sports Foundation (NSSF) and the National Rifle Association (NRA), women are one of the fastest growing demographics in the shooting sports. From 2001 to 2013, the number of female hunters increased 85% to 3.3 million and the number of target shooters increased 60% to 5.4 million. When polled on why they wanted to own a firearm, the top three answers were: self-defense, learning to hunt, and to enjoy shooting with friends and family. Another point from the NSSF study that I found interesting is that nearly 75% of all women gun owners have attended at least one training class with either a professional or a family/friend. Roughly half of all women gun owners will visit a shooting range an average of one or more times each month for practice or training. You may have noticed an increase in the number of first time women shooters at your local range; I know that I have. Unfortunately, not all of that range time is necessarily productive. During my range visits, I have seen some really terrible “training” sessions at nearby shooting tables. I watched one guy hand his girlfriend a .410 revolver, show her how to hold it, and then – with his hand over top of hers, reach in and pull the trigger for her from across the bench. He seemed to find it amusing that she was frightened of the large, heavy recoiling handgun and did not want to keep shooting with it. On a different trip, I saw someone hand another female shooter a semi-auto pistol to shoot before standing by to watch as she gripped it in her left hand and supported it with her right hand… directly on top of the slide. Once was enough for that new shooter, who stopped shooting for the day and waited while her partner finished his range day. Since many women receive training from someone close to them, and many women feel encouraged by family and friends to go shooting, it is a disservice to the new female shooter to not offer proper instruction, especially if it is their first time shooting. As Olympic shooter Kim Rhode said in a recent interview, shooting is a family sport. Everyone should actively participate in the entire shooting process for everyone else in the family to help build relationships based on this common interest and to ensure that everyone in the family is familiar with the firearms in the house. This becomes even more important because a NSSF study showed that more than 40% of women prefer having male present when purchasing a firearm and a similar number feel that they need more training. This is an enormous opportunity to promote the shooting sports and the Second Amendment within a family. I am fortunate that my significant other has been my primary instructor and he takes it seriously. It is one of our many hobbies that we both enjoy and enjoy together. While the actual activity is an equal playing field between the genders, the firearms industry has been slow to catch up to the growing number of women shooters. As a female shooter, I have had to learn to adapt to a sport that is largely designed by and for men. Despite the push for a bizarre progressive agenda, men and women are different. Let’s start with the obvious differences. The average American man is ~5’10” and weighs 196 lbs whereas the average American woman is ~5’4” and weighs 166 lbs. Men are typically taller, weigh more and have less body fat, larger hands, different muscle mass, different lung capacity, and so on. Women are generally shaped differently than men, especially in the hips and chest – a product of being built to produce and care for offspring. All of this should sound like common sense right now, but what does it mean? Women, on average, are smaller in every aspect of the body. Many full-sized pistols are too large (sometimes too heavy) to hold comfortably and consistently for extended shooting periods. However, smaller compact and sub-compact handguns – which may fit better in the hands – tend to have stiffer springs to counter the low mass of the slide, which can prove problematic when manipulating the slide. Fortunately, many manufacturers are designing both new firearms and ammunition offerings that address this recoil issue. Some manufacturers have designed pistols that are balanced differently to help women manage the recoil. How Many People Really Carry Concealed? While nationwide CCW is estimated to be around 4%, some states are estimated to have 10% or more of the population packing (good job, Iowa and South Dakota), with several others following closely. See the chart below for a full state-by-state breakdown. Reasons for the increased number of concealed carriers are many and varied. As depicted in the map above, many states have moved from having no concealed carry or restrictive “may issue” CCW regulations to being “shall issue” states. Even unlikely states like Illinois have joined the concealed carry crowd. This relaxation of carry restrictions allows more people to get carry permits, which may help to remove the perceived stigma of carrying a firearm, which snowballs into even greater numbers as citizens view a firearm as a viable way to protect themselves and their loved ones. Greater reciprocity and even the ability to take CCW training online make it even easier for law abiding individuals to get a permit. Do you or someone you know carry a concealed firearm? Share your story and experiences below in the comments section. Fact: Total concealed carry permits in the U.S. increased approximately 29 percent from an estimated 6.9 million in 2010 to an estimated 9.0 million in 2012.